In 2007, as I approached my 36th birthday, I was given the opportunity to travel overseas for the first time in my life. Prior to that, I had never done much traveling outside of some long drives up and down the East Coast to places like Maine and Florida, and parts in between. I hadn’t been on an airplane since my high school senior trip when I was 18, and the only foreign country I’d ever visited was Canada, but that had just been a road trip over the border to Niagara Falls, so I’m not sure that even counts. The thought of traveling the world had never really crossed my mind. I did not understand what it means to be bitten by the travel bug, but that was about to change. My uncle, Kipp, invited me to join him on a trip with his high school German class to Europe during spring break. It was a trip he made with his class every couple of years. On this occasion he had an open slot for a chaperone and asked me if I’d like to be one. My trip would be completely free except for the surcharge I would pay to guarantee a private single room. I jumped at the chance. I mean, how many times do you get offered a free trip to Europe? For me it would turn out to be twice, but I didn’t know that at the time. Ready to depart with my tiny suitcase. When we went through security at the airport in Philadelphia I was pulled off to the side and searched—it would be the first of three times on this trip I would be specially searched at an airport. I can only surmise that I resembled the profile of what they deemed to be a suspicious person worthy of extra scrutiny—maybe it was the goatee. Eventually we got on the plane for a short flight to Boston, where we would connect to Germany. I had the window seat. The man sitting in the middle seat next to me decided that it was more important for him to spread his newspaper out over three seats with his elbow hanging half over my seat than it was to give me the courtesy of my personal space. It was a short flight so I just pressed against the window and endured it, though nowadays I would probably say something. We reached Boston and boarded a Lufthansa flight for Germany. This time I had an aisle seat, which was key for an 8.5-hour flight during which I was unlikely to sleep. It was my first experience flying international and I couldn’t believe all of the food and drinks were free, so I indulged plenty, perhaps hoping that alcohol would numb the smell of the bad B.O. guy in the seat in front of me. The in-flight movie was Rocky Balboa (this was right before they started letting you choose the movie you wanted to watch on your own screen). When we landed in Germany I had a much easier time getting through customs than in the States. I walked around for most of the first day without being able to hear properly—I hadn’t yet mastered the art of getting my ears to pop during landing. We met up with our tour guide, a British fellow named Tom, who guided us to our bus. Our group was just large enough to warrant our own private bus, but small enough that we each had an entire row of seats to ourselves—a very comfortable way to spend nine days on the road. This trip spoiled me because when we returned in 2009, the bus was filled to the brim with three groups and everyone battling for seats during the entire trip. Before long we were on the Autobahn headed for the city of Munich. After navigating a traffic jam we arrived at the main square in Munich, known as the Marienplatz. We were unable to check in to our hotel until later that afternoon, and I hadn’t slept on the plane, so by this point I was running on fumes. In the end, I would be awake for 32 straight hours on my first day, but none of that mattered because I was standing in Europe! I honestly never thought I’d see another continent. I had never even owned a passport until this trip. Being here was sublime. We arrived just in time to see the famous Glockenspiel spring into action like a giant cuckoo clock. After the Glockenspiel our group split up. Uncle Kipp and I had lunch at a nearby cafe, where I enjoyed my first Euro-beer, plus sausage and sauerkraut. The next day for lunch I would have essentially the same thing, except with fries instead of kraut (the fries were so tasty; they were more like crispy fried potatoes). Besides beer and water, the drink I enjoyed most on this trip was Fanta, a popular beverage over there, which tastes a bit different than in the States–not as sweet, more refreshing and natural tasting (well, as natural as soda can taste, anyway). After lunch we did some sightseeing. The Feldherrnhalle (sight of the Beer Hall Putsch of 1923, Hitler’s unsuccessful first attempt to seize power). One of the massive stained-glass windows inside the Frauenkirche. I couldn’t fit much of the cathedral into this shot, the downside of only having a pocket camera. 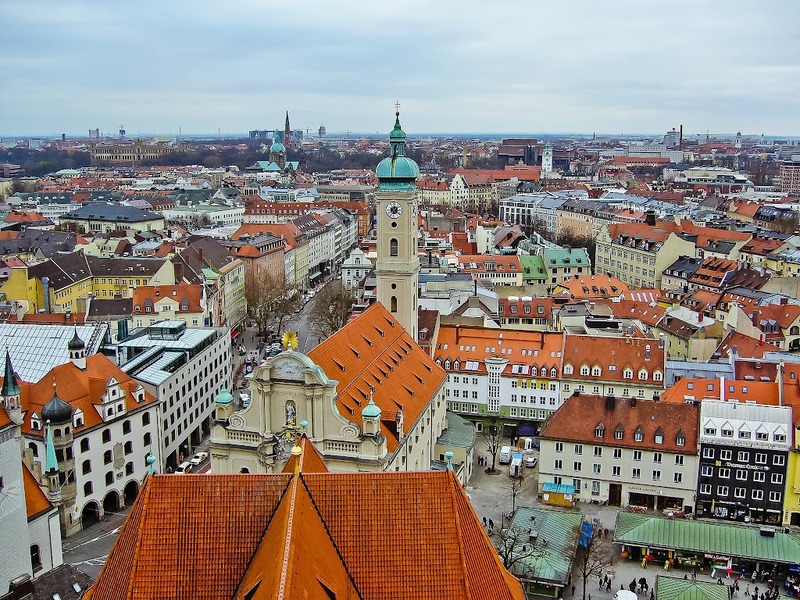 Later we climbed 300+ steps to the top of the Peterskirche tower to enjoy some spectacular views of Munich. The inside of the tower, with its winding steps and dark, narrow corridors, really makes you feel like you’ve traveled back in time to the medieval era. The Olympic Tower. On a clear day you can see all the way to the Alps. Looking down at the Marienplatz square. While up here we also got a birds-eye view of the Glockenspiel in action. A little later we met up with the rest of the group and headed back to the hotel to finally check in before heading out to dinner. 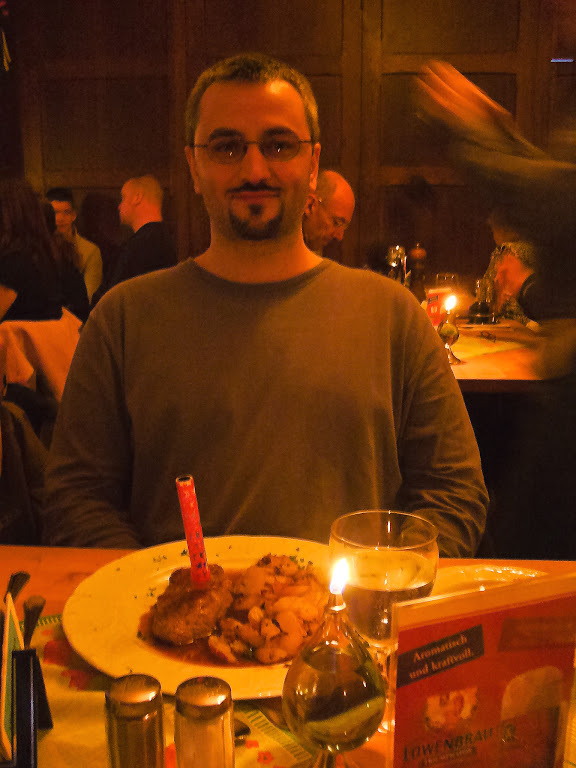 All dinners were included in the tour, but the best meals were in Munich because we went to actual restaurants (dinner was served in the hotels of the other cities we visited). The first night also happened to be my birthday, so Uncle Kipp arranged for the waitress to bring out a steak with a firecracker in it and the group sang Happy Birthday. My other recollection about that first restaurant was that they served the best tomato soup I ever had, almost like eating spaghetti sauce. 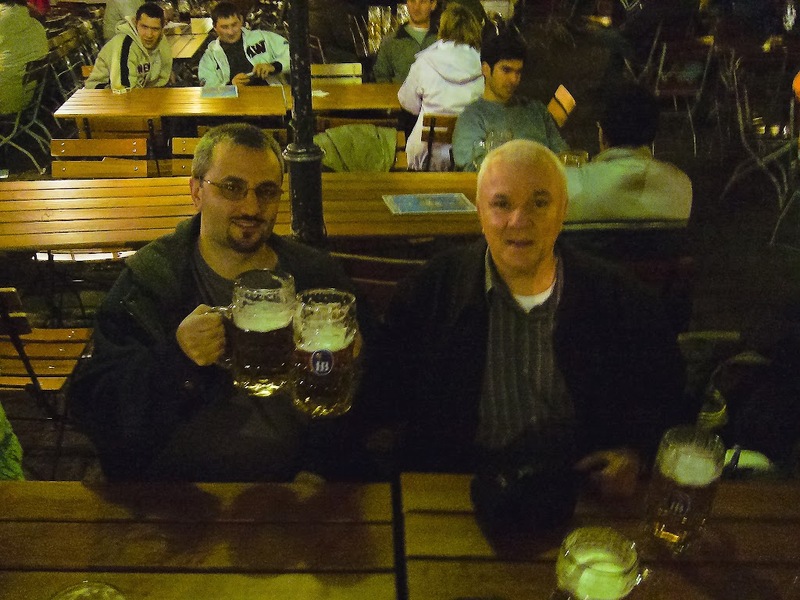 After dinner we headed to the famous Hofbrauhaus for drinks and I had my first Mas beer, which is a draft beer served in a full liter mug. The beer in this region is very easy to drink; it goes down much more smoothly than beer in the States (I’m not a big drinker, so it only took 2 1/2 of these Mas mugs on the second night to give me my first hangover since college). Later that night we returned to the hotel for a much-needed night of sleep. In the morning we would be taking a tour of Munich followed by a visit to the Dachau concentration camp, which will be covered in the next installment. Love the suitcase. We each had one suitcase on wheels but they were huge. Now you are a world traveler with tons of ideas of new adventures. You were certainly inspired on your first trip. Yes, who knew that one trip would open the floodgates to all the adventures I’ve had since? I never expected to be bitten by the travel bug, but once you get a taste of it, you want to go back for more.